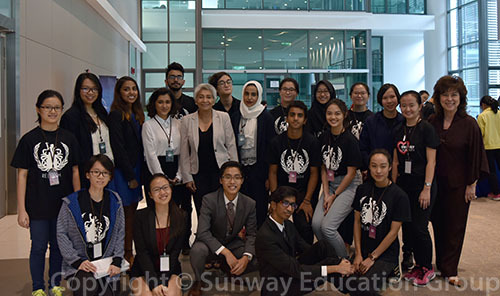 Addressing the opening of SUNMUN 2016, Dr Elizabeth Lee, Senior Executive Director of Sunway Education Group and Sunway University hoped that the conference will lead students to a deeper understanding of world issues and contexts as the issues are negotiated and resolved. “As we move ahead into the future, you and the generations to come will need to be equipped with new knowledge, skills and values needed in a competitive global setting. You will need to be better educated and knowledgeable so that you can be responsible adults, good citizens both of your own country and the world,” Lee added. Lee believes students are the future and with the ability to challenge social norms and values, they can slowly shape the world’s social and economic development. She also encouraged the students to step up and take ownership for a world they desire and help make the world a better place. The SUNMUN 2016 Secretariat and admin team with keynote speaker Professor Datuk Dr Mazlan Othman (standing 5th from left-in white blazer) and Dr Elizabeth Lee (standing on far right). Dzafran Azmir, President of SUNMUN 2016 shared that he was exposed to a completely different experience as a member of the Secretariat. The organising of the conference challenges Dzafran and his team in applying their planning and management skills to bring the best out of SUNMUN, and to create a platform that enhanced the experience as a whole. Dzafran hoped this year’s conference will bring a new chapter in SUNMUN by shifting its focus towards the original intent of the event – an avenue for debate. Dzafran is currently pursuing his degree in BA (Hons) in Communication at Sunway University. The student-run-conference received tremendous response from universities and schools. Although majority of the delegates came from universities and schools around the Klang Valley, the conference also welcomed delegates from Penang, Johor, Sarawak and Singapore. enjoyed. Many novice Model United Nations delegates were interested and keen to participate in the committee and topics,” Prishanth Linggaraj, Secretary General of SUNMUN 2016 said after the end of the 3-days conference. Prishanth shared that although there were academic aspects in last year’s conference, many of the delegates focused more on the social aspect. “This year, we put more effort to try and maintain a balance between intellectual discussion and fun. The team came up with interesting topics and the student officers selected were of the highest quality.” Prishanth is currently pursuing his A-level in Sunway College. The SUNMUN 2016 followed The Hague International MUN Format (THIMUN) and the Harvard MUN Format (HMUN). The conference featured a riveting selection of committees, including the United Nations Human Rights Council (UNHRC), United Nations General Assembly (UNGA), International Atomic Energy Agency (IAEA), Disarmament and International Security (DISEC). The team also brought in and featured 2 specialised councils of a more historical nature – the Cold War Cabinet, a revisit into the 1948 Berlin Blockade; and the Historical United nations Security Council, to re-examine the South African Border War from the 1960s. The committees aim to provide the young delegates a platform to be involved in vital decisions made in the international affairs arena.